Made of heavy leather for years of wear. Fits size large (40" long) but you can cut for smaller sizes. Black leather with steel hardware. 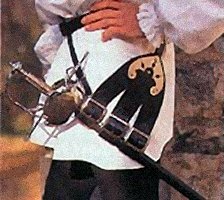 The large adjustable straps allow for a variety of sword widths.